I made this beautiful square Trinket dish from porcelain clay and glazed with my most popular glaze = Turquoise, also called Aquamarine. I also stamped cute little music note duos on a bed of floral designs and cute swirls. This will be the perfect gift for a musician friend, perhaps, or anyone who loves music. It will be handy to hold rings, bracelets, necklaces, a tealight candle, etc. I play the piano, (from 10 years old), so love anything musically designed. 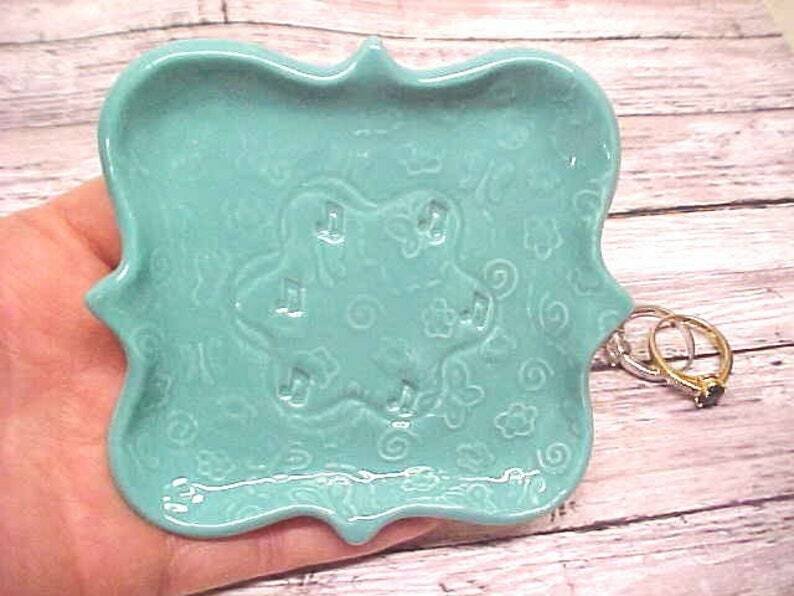 SIZE: This Fancy Square pottery tray measures about 4 inches square from tip to tip. I also add cork pads on the bottom. Ready to ship when you purchase! Thanks!